The beauty of a mobile safari is that we can go anywhere, and set up a comfortable base camp from which to go and explore our surrounds. Our main locations on Safari are found in Northern Botswana, one of the last truly unspoiled wilderness areas of Africa. We also offer Safaris in other exciting places across the continent for those looking to explore more. The list of destinations below are highlights of Botswana that we love and regularly visit on Safari. The richest and most varied habitat in Africa, with the highest concentration of predator prey interactions in the world make this a bucket-list destination all year round. Botswana’s Okavango Delta is perhaps Africa’s most aspirational safari destination. The wetlands of the Delta, swollen with waters from the Angolan Highlands 1250 km North West of the Kalahari Desert recharge animals, birds, trees and plants alike with it’s life giving waters. The 1000th World Heritage site, the ‘river that never reaches the sea’ offers a multitude of different treasures depending on the season, the timings of the rains and the extent of the annual flood. 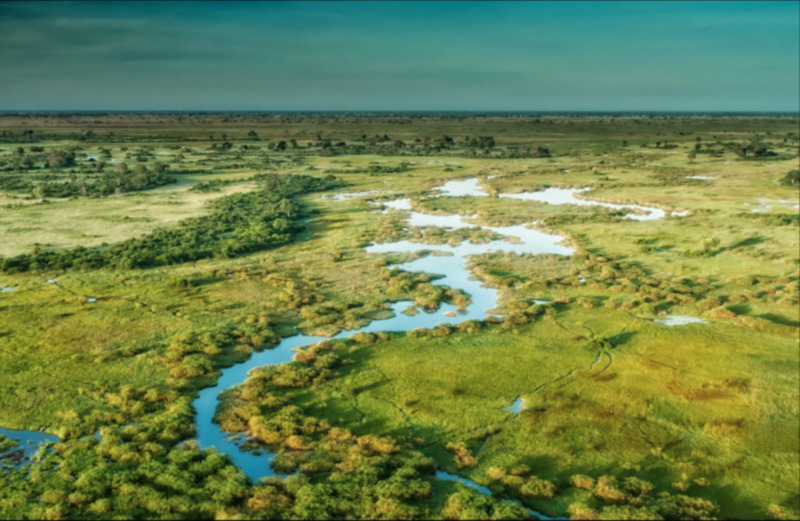 Maunachira channel, one of the Northern major channels winding it's way through the mosaic habitat that makes up the Okavango Delta. Sit on the dried up fringes of ancient Paleo-Lake Makgadikgadi, the largest lake the world has ever seen, and ponder one's evolutionary routes back to this place, home to mitochondrial Adam & Eve. Walk with meerkats as they go about their daily business, quad bike across the salt pans with the wind in your face or just sit back and watch the biggest Zebra migration south of the Serengeti from your swimming pool. Witness the largest zebra migration on the planet, aptly named the Serengeti of the South; the Makgadikgadi Salt Pans. Explore vast flat ancient fossil riverbed systems surfaced with undulating lawn of Kalahari grasses as far as the eye can see. Here you have a great prospect of spotting the black-maned lion and cheetah in the green desert, best between Nov - April. The famed black-maned lions of the Kalahari, popularly described in Mark & Delia Owens' fascinating book; Cry of the Kalahari. Walk with the bushmen, as they go about their days. The women gathering roots along with a teenage girl who knows over 150 different species of plant, by name food potential and medicinal use. The men moving out to find food, whether by hunting or gathering. Xaoxam poses for the camera with the bow and arrow he has made; the arrow tipped with lethal neuro-toxic beetle larvae. Please feel free to contact us to find out about our 'explore more' destinations across Africa.